Am I the only one who bought a Nerf Archery setup after sitting through the Hunger Games saga? I’m pretty certain that the lines got longer (RIP Toys R’ Us) and the orders doubled in numbers at every toy store and archery equipment manufacturer worldwide. Who wouldn’t want to emulate the noble Robin Hood stealing from the rich and give to the poor?—Or at least try their hand in how he can work his way around a bow. Although it has been around for years, archery has hit the big screen—and along with quite a few awards—has also made its way onto the scene as a great go-to hobby or a fun to-do activity. From signing up for archery classes to borrowing your neighbor’s Nerf bow and arrow, there are so many ways to pick up the sport. If you think a game where players use a bow and arrow to score points on a target is hard enough, trying to nail a moving target is even harder. Ever wondered what mixing archery, paintball, and dodgeball would be like? Imagine an evil scientist formulating the basic game of classical archery, studying it, then when trying to evolve it, accidentally causes an unexpected mutation—turning the game of controlled, flying arrows into an all-out war. Although not really concocted in a lab, this game is the most fun experimental hybrid you’ll ever encounter. Known also as combat archery and battle archery, bow tag is becoming increasingly popular as a sport that uses some of the classic archery fundamentals to form a fun, team-based game with a variety of playing styles. How does archery tag work? Depending on the type of game you’re playing, your team captain may be commanding a variety of different tactics and strategies. However, with all the formats out there, it is equally important to establish your best archers and different players strengths and weaknesses before starting the game. Who has played or has done archery before and is most likely to be accurate? Who is the most agile and best to dodge arrows? Who is the quickest and most able to retrieve lots of arrows from the safe zone (or catch them)? If you are ultra-competitive, (who isn’t? ), setting up your strategy before the whistle blows can help lead your team to victory. What do you wear to an archery tag event? Although looking good isn’t the goal of the game, there are specific clothing and equipment requirements to follow while participating in a game of archery tag for player safety (and team unison). While there is no specific dress code, you should wear athletic gear or sport-style clothing. Since it’s a fast-paced game, your clothes shouldn’t be constricting and should allow you to be nimble in dodging the arrows. Following your common sense, don’t wear high heels—unless they are some pretty comfortable wedges (just kidding—please don’t wear high heels), open-toed shoes nor anything that will mess with your ability to dodge, dive and duck. In addition, if you’ve got long hair, whipping it back and forth might be a great dance move but it won’t help you here. Having it tied back with nothing hanging in the neck area is your best bet in archery tag. Dress to impress—but also to not get injured. A snakebow is designed for recreational archery, which is perfect for beginners since it’s very straightforward to operate. LARP-safe arrows are arrows that are blunted at the end and designed to minimize any impact when fired at a player. Don’t worry, these will not pierce your skin like regular archery arrows (thank God)! How much does archery tag cost? Thankfully, entering in a game of archery tag won’t cost you your life—just about the same price as a movie ticket and some popcorn. (Which is a small price to pay for some amazing fun). Plus, you’ve already paid that much to watch the Hunger Games—why wouldn’t you pay it to actually live out the action? The price can change from facility to facility—or even be cheaper if you’re setting it all up yourself. Fortunately, the sport is becoming increasingly popular among university societies where the costs may be cheaper and equipment available to rent. Typically, you’re looking at $25 to $35 for a 1.5-hour session of combat archery, depending on the day of the week. Weekends are peak days, so prices will be more expensive then compared to off-peak times during the week. Check your local provider for their own price list and also whether there is a cost for equipment rentals. If you are new to the sport, it is unlikely that you will want to purchase all the equipment before trying bow tag out. How safe is archery tag? 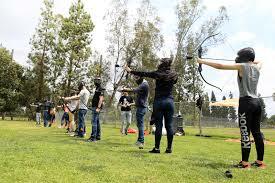 Although archery tag is a safe game to play (safer than the Hunger Games, at any rate), it should not be played by anyone under the age of 18 if not supervised by a parent or guardian. Fortunately, the arrows used in the game are blunted with a foam or rubber material and should not hurt if they’re shot from the minimum distance. Especially if players are all wearing the essential equipment, including face masks and armguards, there shouldn’t be any impact injuries. However, just like any sport that requires fast-paced movement, there are always risks of muscle injuries if players do not warm-up sufficiently or take the necessary precautions. If you’re just watching the game to begin with, safety is even important for spectators. If the field doesn’t have any netting at the back of the attack zones, spectators should watch from a side-on position parallel to the safe zone at a safe distance away from the field. Battle archery is exactly the same as archery tag, combat tag or bow tag. The names are just different because of trademark reasons. Archery Tag is a trademarked company name, which is a known supplier of battle archery equipment. If you see articles written about battle archery, don’t get confused, no matter the name—they’re all the same sport. How many yards do they shoot from in Olympic Archery? Since 1990, classic target archery has been featured at the Olympic games. The shooting distance in Olympic archery is a lot greater than in combat archery. Typically, athletes have to shoot from 70 meters at targets that are 122 cm in diameter which have 10 concentric circles of differing colors. The innermost circle, also known as the bullseye, scores a maximum of 10 points. While the lowest score on the outer most circle is 1 point. What kind of events can people play battle archery? No matter what event is being held, battle archery can be great for a variety of different get togethers. If you are based in the 77077 or 77052 area, you should check out possible areas for archer tag. Battle tag can give you a really fun group experience with many venues offering affordable group rates. Come Out, Load Up, and Fire! While classic archers may not favor the commercial aspect to archery tag, the game is a fun mix of a few popular sports and can be a useful gateway for those who want to take up traditional target archery. Perfect for family, friends, and team-building group events, Archery Tag is growing in popularity as a safe and inclusive “extreme” sport. Before selecting a venue, you should ask questions about renting equipment to make sure you don’t have to purchase any equipment—especially if it is only a one-time experience. Whenever you play archery tag, always be mindful of the safety regulations and game rules. This game is meant to be safe—but a heck of a lot of fun! Next time you are looking for something fun to do, consider archery tag as a fun group experience. 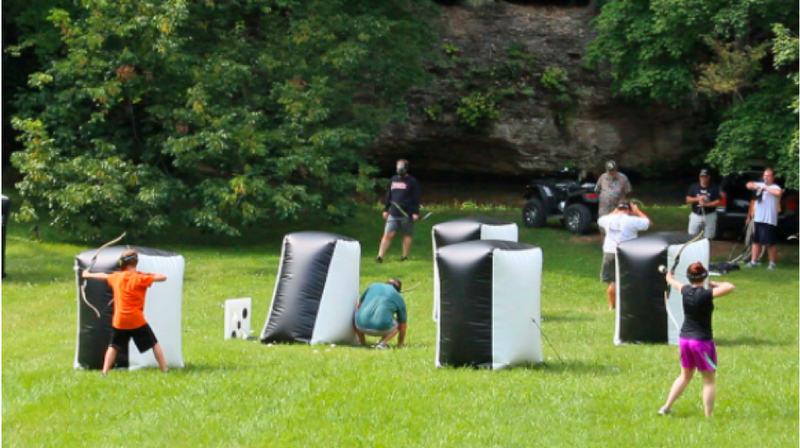 The team from Global Archery Products brought Archery Tag® and a S.A.F.E. Archery® Hoverball® to Eastern Kentucky University for their new student orientation. Students, faculty and visitors had a great time playing match after match on the EKU football field in Richmond, KY.